Kebaba believes in the power of delicious. With truly authentic items including hummus, falafel, babaganoush, kebabs, gyros and schwarmas, Kebaba also specializes in unique Bend-inspired takes on ethnic dishes and daily specials. 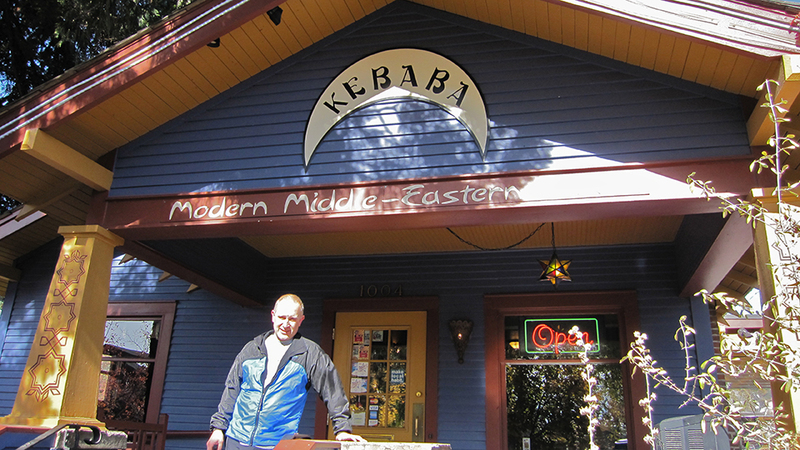 You’ll find Kebaba in the purple house on Newport Avenue on the west side of Bend, Oregon. Since opening their doors in 2006, their deck and garden patio have offered the perfect place to relax with friends and family enjoying modern Middle Eastern cuisine, handcrafted cocktails and a thoughtful menu of wine and craft beer selections. Indoors, you’ll find a cozy and welcoming dining room with tableside service at dinner and counter service at lunch. Kebaba’s award-winning cuisine features ethnic and vegetarian options made from scratch and they can always accommodate special diets including vegan and gluten-free. A locals’ favorite for takeout and catering, you’ll love their healthy affordable dishes that incorporate fresh ingredients and bold flavors and you’ll return for the casual, friendly and delicious experience of neighborhood dining with an upbeat vibe.